A CCTV system with a PTZ camera installed on our Security Robot S5 PTZ is an effective CCTV solution for open spaces. The PTZ camera has the capability to zoom in and recognize a human at distances of up to 330 feet. Its Pan and Tilt (rapid mechanical pointing and panning) function allows for rapid mechanical pointing to ensure reliable tracking of a moving object. Following its well-designed purpose, the S5 PTZ moves into optimal positioning for long-range surveillance and monitors the entire surrounding area as well as any particularly dangerous parts of the scene. 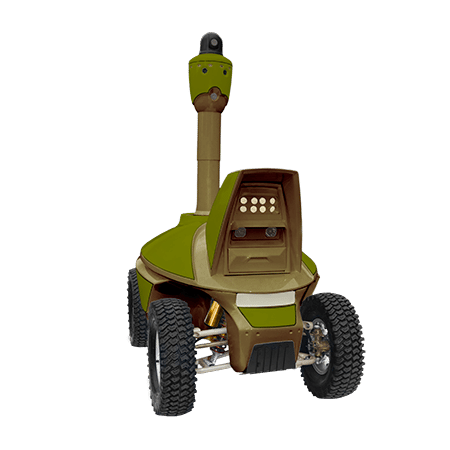 Thanks to its mobility, the robot changes its surveillance position at regular intervals; however, keeping the S5 PTZ in stationary surveillance mode most of the time is advantageous. This mode allows both manual PTZ camera control and automatic tracking of moving objects. Upon activation, the video feed from all the cameras is analyzed to form 360-degree panoramic viewing. Moving objects within the panoramic view are detected, and the smart analysis system commands the rotating PTZ camera to point at the object. Moreover, the panoramic CCTV cameras allow 360-degree in-motion surveillance at a distance of 10 to 20 meters. When choosing the surveillance position, please take into account that the camera is located 5 feet above the ground, so trees, bushes, or other obstacles of similar height will impede the PTZ camera’s capabilities. The CCTV system is installed on the S Series Autonomous Unmanned Ground Vehicle. The placement of the mobile CCTV system on a vehicle allows rapid security system deployment. The automatic relocation feature and considerable effective surveillance range allows for large areas to be secured with rapid deployment of the CCTV system to cover dangerous incidents and areas. 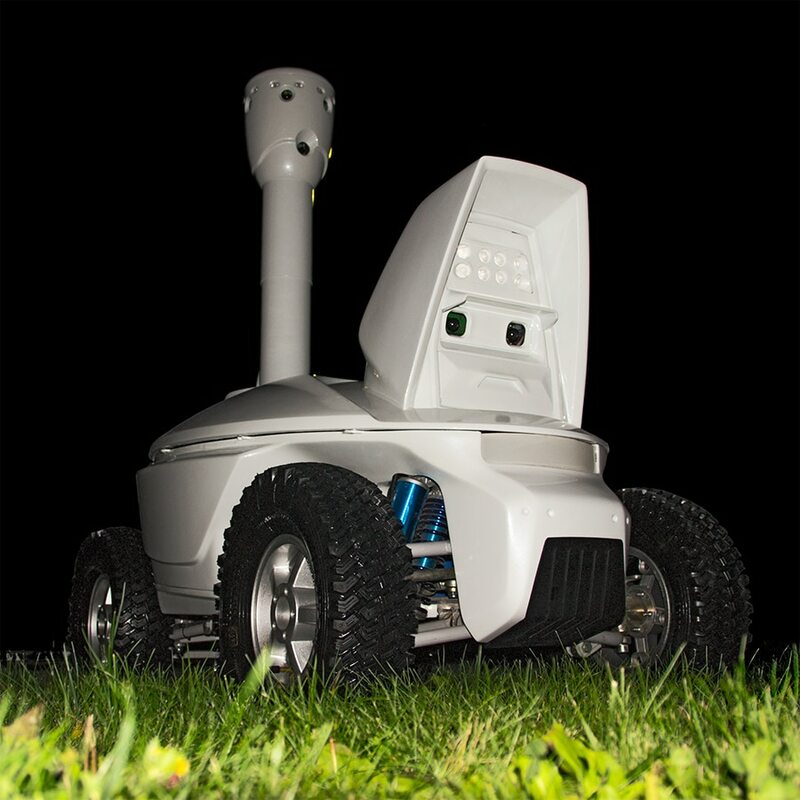 The S5 PTZ Security Robot can move between surveillance positions autonomously, or without human input. 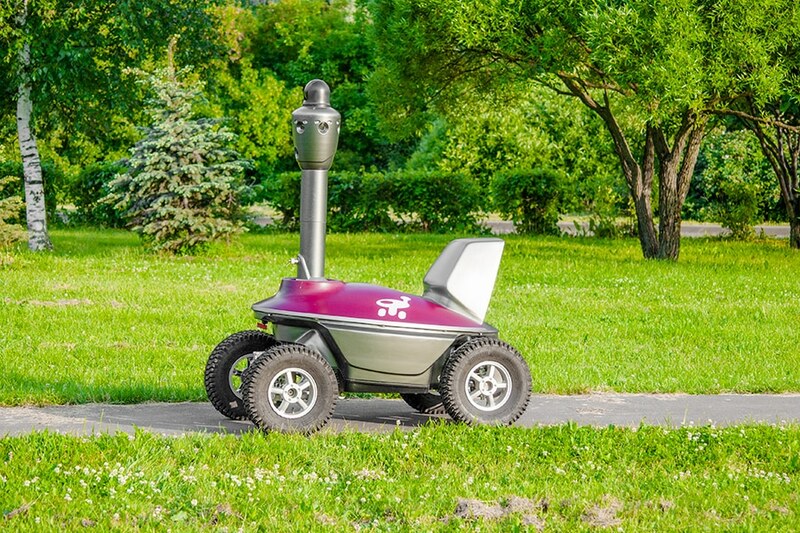 The Mobile Surveillance Vehicle base robot is designed for roads with good surface traction characteristics. The robot is not intended for use on public roadways. The best speed and movement stability characteristics are achieved in unmanned areas. Regular human and vehicular traffic can restrict or even prohibit the robot’s operation. The Security Robot allows remote CCTV surveillance for recorded security activities by using WiFi. Compressed video feed from the cameras is transferred through the internal WiFi module. In optimal conditions, the distance of data transfer between the robot and its base station may reach further than one half of a mile. However, the electronic terrain of the secured area may require extra transponders to be installed to extend radio signal coverage. Video feed from the CCTV cameras may break up in areas with poor reception, but the mobile robot will continue to move on along its programmed cruise route. If there is no need for in-transit CCTV surveillance, ensuring stable WiFi signal in positions of stationary surveillance is enough for S5 PTZ’s secure operation. Video from all the cameras is recorded by the internal multi-channel digital video recorder. The DVR storage space and compression rate suffice are prepared for one week of operation. The archive can be copied to an external hard drive; this may take a few hours, so it is advisable to perform this operation when the robot stops for battery recharging. Fragments of the video archive can also be viewed while the robot is on the patrolling route. A WiFi interface is used for that, however it should be noted that the channel has limited bandwidth, examining long video fragments is made more convenient by using a PC connected to the archive data storage medium with a high-bandwidth wire interface. The patrolling robot sends digital data using a wireless data link via a stationary transponder to the mobile device (tablet PC), which is carried by a walking security service officer. The same information is available to a remote user via a desktop computer through the Central Monitoring System, which provided that a safe data exchange mode for public internet channels is used. Along with the video feed from the CCTV cameras, the program interface windows display robot’s current location on the secured site map, the state of the robot’s systems, and the battery’s charge. 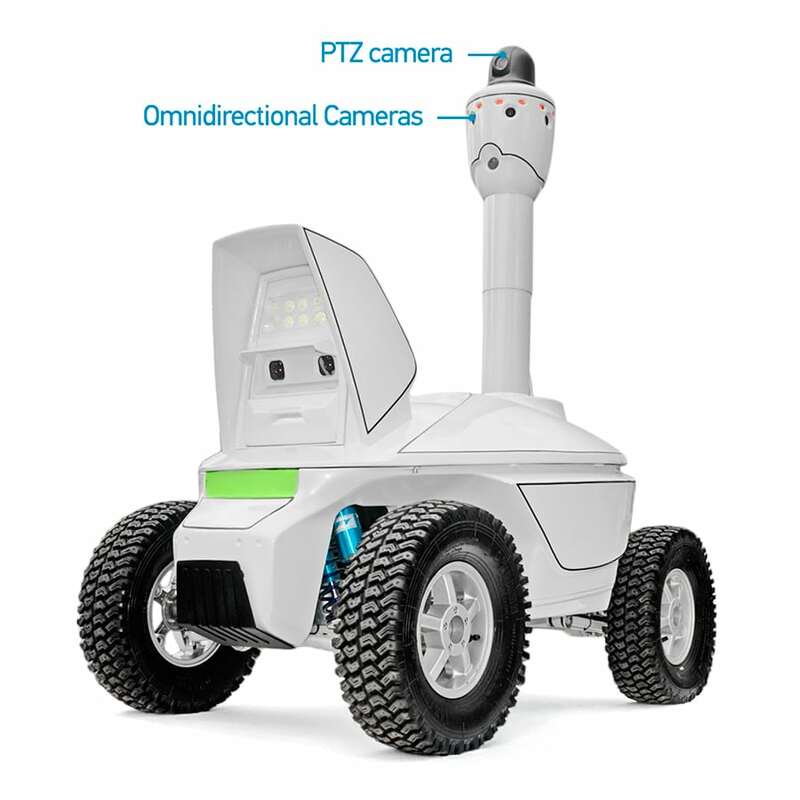 An authorized remote user is able to change the robot’s patrolling route, control its PTZ camera, and switch on the alarm signal on the robot. The user interface software allows several mobile robots to be managed while operating within the same secured site. The guidance system records location by using visual landmark recognition. This technology ensures reliable pathfinding in built-up and landscaped areas. The best passage way for the robot is a walkway about three feet wide. The color difference between the way and the rest of the territory provides information for accurate path adjustment. The combination of these solutions allows the Mobile Surveillance Device to accurately complete routes up to a few miles long in areas with no GPS coverage. The navigation system cameras need enough light to recognize visible landmarks; at daytime, their sensitivity is sufficient to ensure stable system operation. However, the territory under surveillance needs to be illuminated by street lights at night. Standard 6 lx illumination for urban walkways allows for stable patrolling. In case there is not enough light on a cruise route segment, night markers can be set up along that part of the route. Artificial illumination allows the robot’s installed cameras to effectively operate. 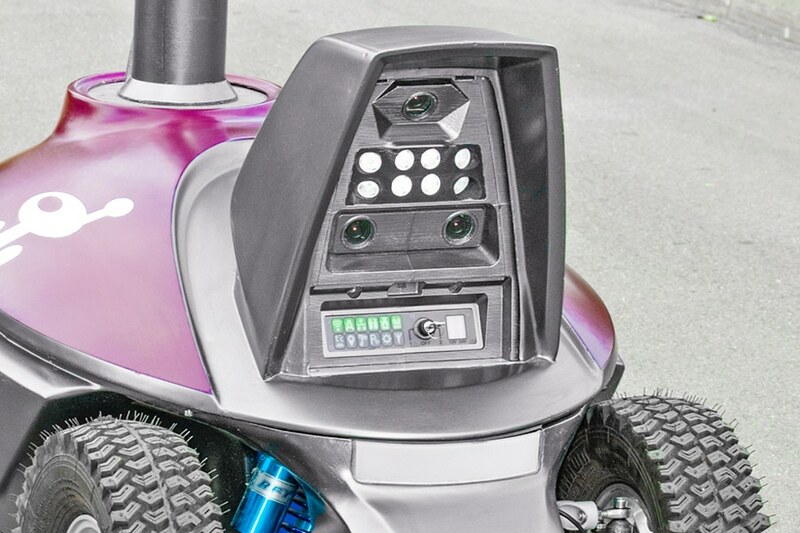 The security robot is equipped with a low beam headlamp to illuminate the road surface. The LED headlights provides bright illumination necessary for correct operation of the stereoscopic camera used to detect and avoid obstacles. The low beam headlamp switches on automatically at dusk. The S5 PTZ Security Robot automatically returns to its charger when low on power. For operating convenience, the robot is equipped with a colored semi-circle lamp status indicator, which is easily seen at a distance of more than 10 feet. The indicator informs of the robot’s maneuvers, battery charge state, temperature behavior, WiFi availability, and system failures. The robot is switched on and off by using a removable mechanical key that is inserted in its key hole located on the diagnostic panel. The panel is fitted with illuminated LED indicators that display the operating status of the electronic modules, allowing for troubleshooting and repair of the robot in case of failure. In case of a guidance system crash, the robot is recalled from its patrolling route manually by using a mobile computer.